We're two eager travelers with roots in the US. Having explored quite a bit of our home country together, we set our sights abroad and kickstarted our foreign travels in Southeast Asia. With everything we owned in our backpacks, we set off on our five-month trip. Having traveled Japan for the past 35 days, we're well on our way to our new home for the following two weeks, Vietnam. There are countless ways to explore this developing nation, and everyone has their own take on the subject matter. 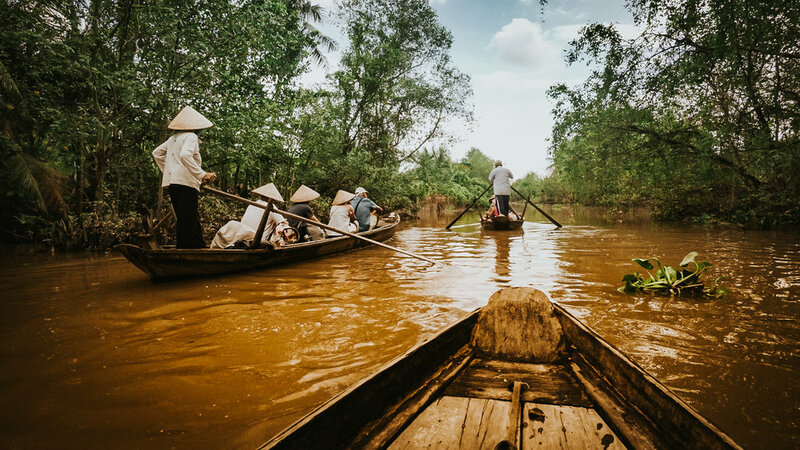 From the busy city life with endless markets and awesome street food to the pristine beaches and breathtaking mountain views, Vietnam has a little something for every kind of traveler. 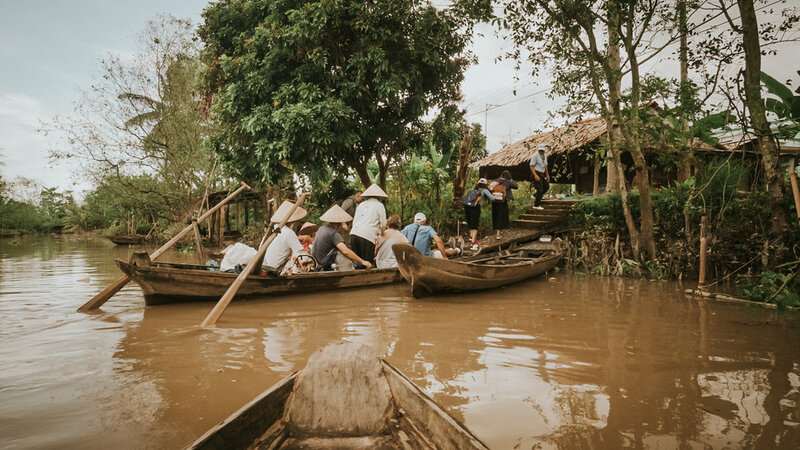 The options can be overwhelming when considering your trip to Vietnam, so to help narrow down the possibilities, we'll highlight some of our experiences to give you some inspiration and personal know-how! What day is it today and where did we stay in Ho Chi Mihn Cty? Today is Tuesday, the 20th of November, 2018. Saying farewell to our new friends at the Jungle House Hostel, we relocated a couple alleyways down to the BFF Saigon Hostel for a night. We like trying out different hostels and seeing the different styles of each. Hostels here are heaps different from in Japan. In Ho Chi Minh, hostels are not merely a place for travelers to slumber; they're also lodging for the people running them. Usually located in cramped alleyways next to a series of other guesthouses, massage parlors, and actual homes, the hostels themselves are a bit tricky to locate and a small sign out front suffices as their address. At BFF Saigon, a child checked us into the hostel, his mother showed us our room, the sister napped, and the grandmother stocked the fridge with beer and sodas. Outside, a shirtless man puffed cigarettes and greeted us, while another Vietnamese man, passed out drunk in the alley, was being prodded by a store owner. This was perfectly normal to us by now. What did we explore today in Ho Chi Mihn City? Playing tourist yet again, we booked a one-day tour to visit the Mekong Delta. Seeing as how the river is most easily accessible by a bus, we left the guesswork out of it and bought two tickets for the 7:30 AM bus. The tourism industry here is very well-oiled and fleets of buses are departing every hour to popular locations all throughout Vietnam. For a decent price, you can find yourself in any major city in a couple of hours, depending on your desired destination. From Ho Chi Minh, it took us about three hours to reach the river, including a rest stop. When we left the bus, we all filed into a wooden boat from which we would float down the river on. 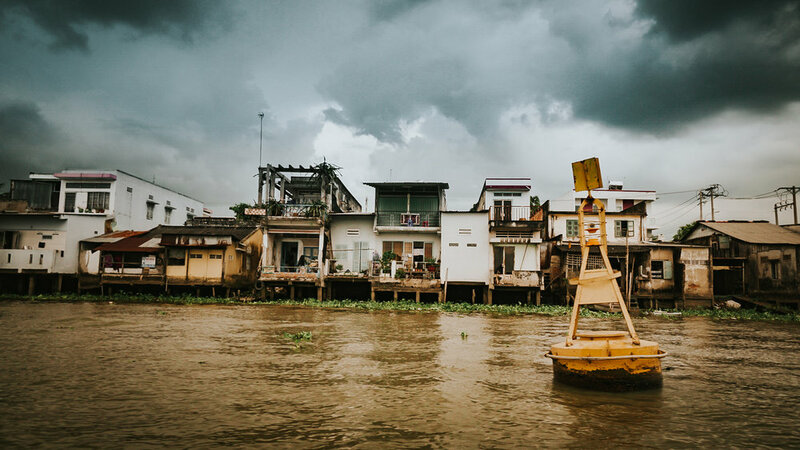 The first thing we noticed about the river is it was littered with piles of dunnage and filth, the water resembling sewage with its murky-brown consistency. We learned that sediment collects into the river and doesn't quite deposit, giving the water its unique color. Our guide explained to us the way of life for the folks on the river. People lived in boats and sold all kinds of goods - from local fruits like coconuts and bananas to clothing and coffee - to merchants at wholesale prices. The merchants, boats full of goods, would float back down the river and unload the goods, selling them at retail prices. Crumbling building and rusty shops were dispersed throughout the riverbank as people washed clothes in the river and hung them to dry. Shortly after, we docked the boat and departed to learn how various foodstuffs were made. Rice, tropical fruits, and coconuts are large exports of Ben Tre. Our guide took us on a tour throughout a workshop, and we got to see how rice paper was prepared. We also saw how a few different kinds of coconut candies were hand-crafted, packaged, and exported. 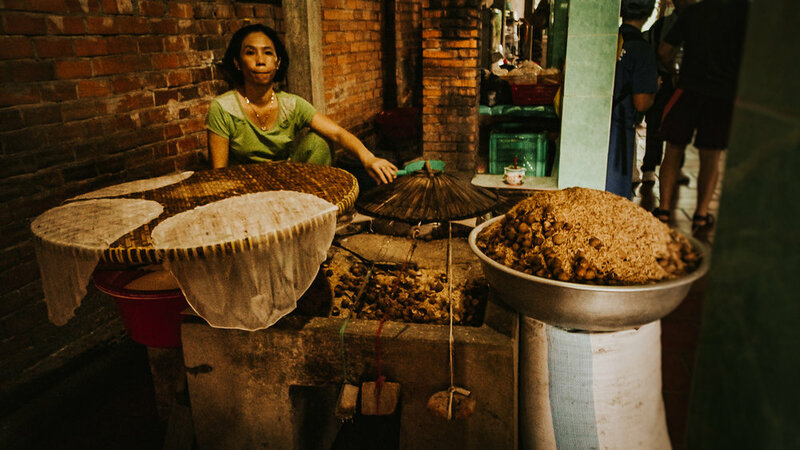 We sampled some of the sweets, along with tasting some rice and snake wine made fresh on site. We realized that a ton of effort is required to make a couple candies and booze. Departing from the boat we ventured through the wild brush and durian filled pathways to reach a folk music performance. 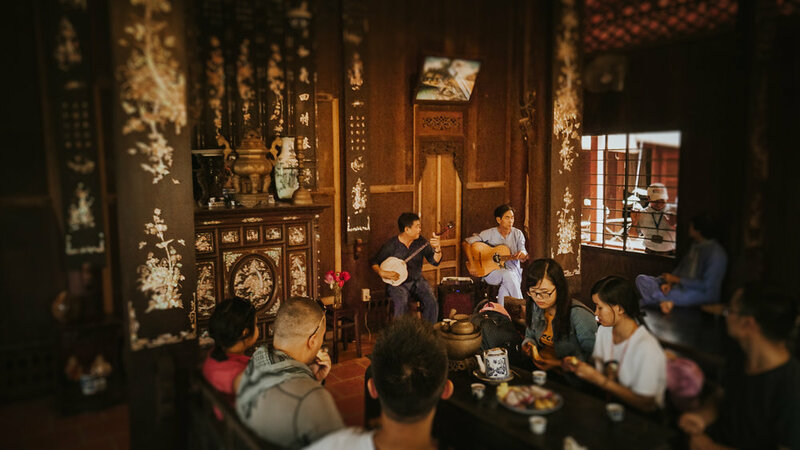 Crammed into a room elbows to elbows, our unease was soothed by the swing of a wrist on Vietnamese instruments and caressing vocals. Listening to music across the sea on our modern devices is one thing, but to be in the flesh enjoying it in the moment… priceless. All the while being served tea, dragonfruit and bananas, this tour turned out to be worth while. Afterward, we climbed back on board and cruised down the riverbank for an hour or so until grabbing lunch. Being seated with others, we were able to speak with some Taiwanese girls. They gave us more insight to their culture, but also how each culture comes and views travel differently. We all have certain backgrounds, and blending our viewpoints together is something tours help to establish. Rusty bikes with faulty brakes were the mode of transport back toward the boat after lunch. We took the boat out to the main land. Riding down the river, we were graced with some rain before we got out and explored the markets. Our guide showed us the various items for sale - chicken feet, crabs, snails, and snakes - and huge fishing nets to capture some critters yourself. And that was it! Tour over. Hopping back onboard the bus it was a bumpy three hours back to Saigon where we grabbed our bags from Jungle House hostel, and made our way to check in at BFF Saigon. Hungry after the tour and lugging our baggage around town to BFF Saigon, we had some dinner at a so-called vegan restaurant. While the vegan meals here are so-so, they’re worth the effort in a meat filled location. Walking the streets, we got some pastries from the bakery. Normally a bakery is a place we’d avoid in the States, but considering it’s so cheap here in Vietnam, we’re taking the opportunity for some delicious snacks. Taking the matcha bean buns and other treats to the park across, we watched a dance performance wrap up in the park. It seems that a lot of the locals come out at night. Understandably so as the heat rises throughout the day, and exercising during the heat is a disaster. Therefore if you want to see Saigon come alive, see it at night. But be aware! A sketchy dude approached us, mumbling something about a smoke while eyeing our bags. When we didn't budge with legs already guarding our essentials, he crept back into the darkness... strange. What kind of traveler are you? Practicing mindfulness on the go is not only effective for your travels, but enhances your life. Find out how. Taking our travels outside of Saigon, we ventured off into Mui Ne to see something extraordinary. Do you take tours when traveling? We tried one out for the Mekong Delta. Should you buy a motorbike in Vietnam? Our second day in Ho Chi Minh leaves a lot up for trial. What should you do with a full day ahead? Rushed on by crowds and motorbikes, what did we do for our first day? Our last day of Japan gives us plenty to reflect on when engaged mindfully. Have you ever heard of the Cu Chi Tunnels? 1 Week To Change Your Life Forever!